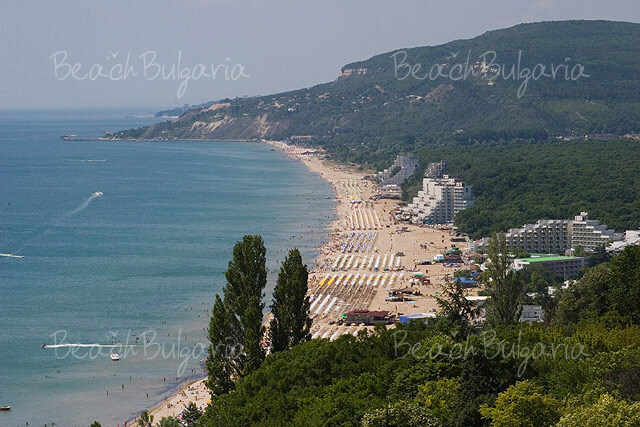 Albena is located 30 km from the town of Varna and 12 km from Balchik resort in the northeastern Bulgaria. 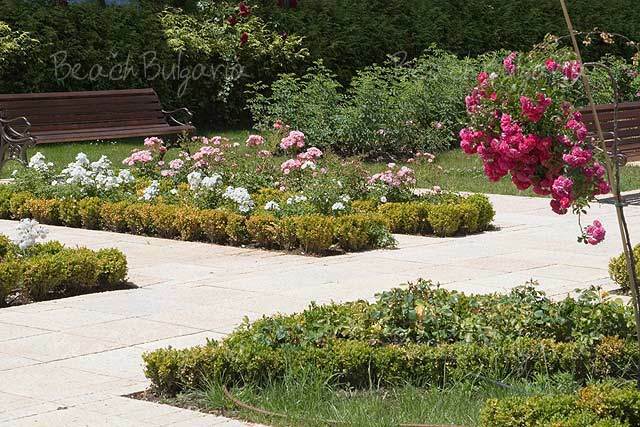 Albena is situated at a picturesque and ecologically clean gulf on the Black Sea coast, famous for its flower gardens. 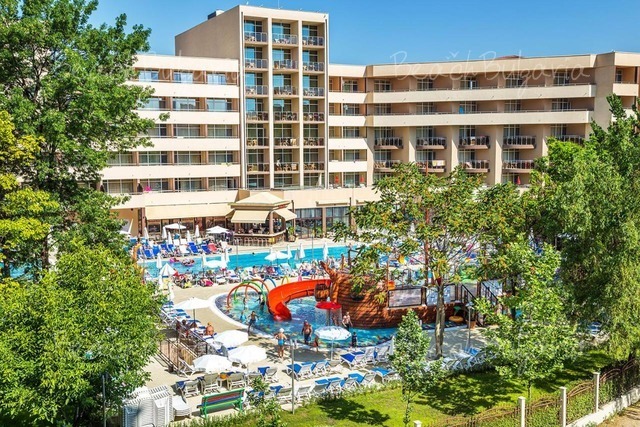 Albena is a Blue Flag winning resort. It is remarkable for its 5-km long and 150 m wide beach with fine and clean sand and crystal clear, calm and warm sea water. 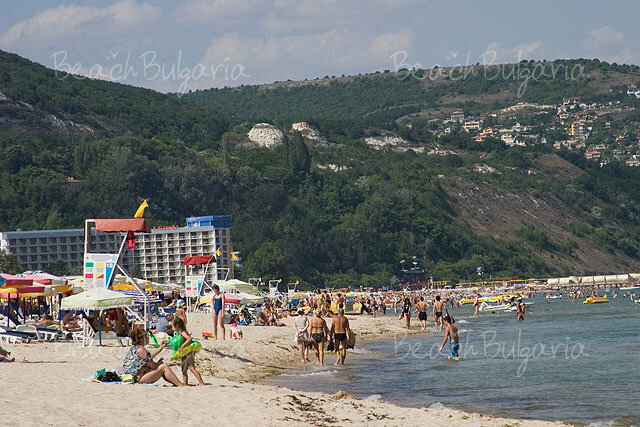 The tourist season in Albena lasts from May till October. 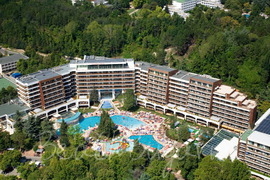 Albena offers mineral water springs with temperature 30°C and several SPA centres. 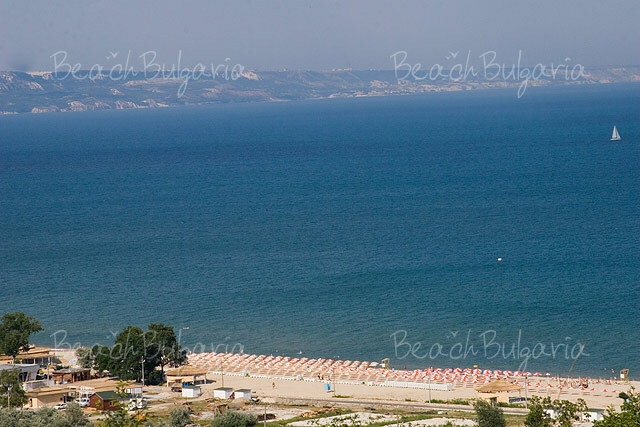 Albena resort is situated 30 km from Varna and 12 km from Balchik in the northern Bulgarian Black sea coast. 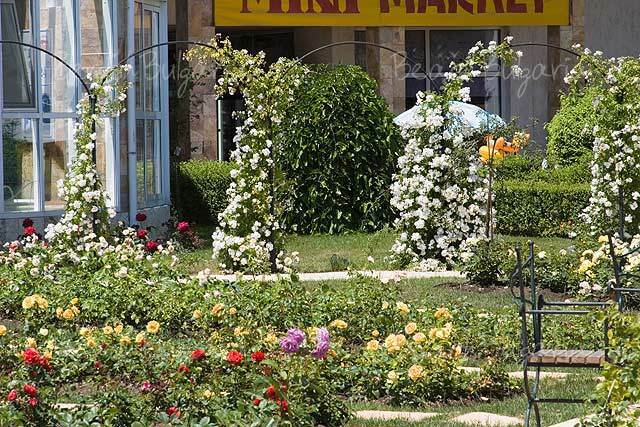 Albena is located at a picturesque, ecologically clean gulf. 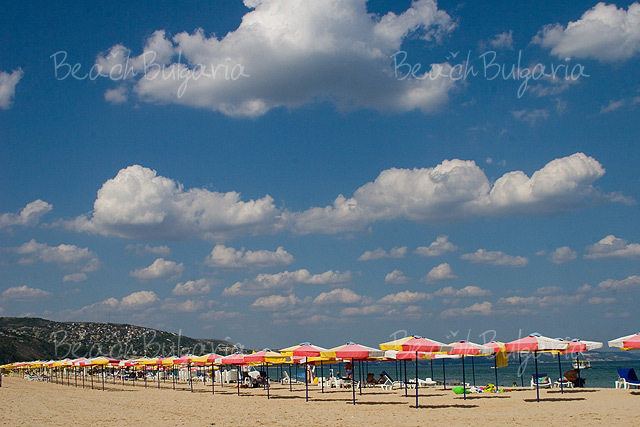 Albena is a Blue Flag winning resort. It is remarkable for its 5 km long and 150 m wide beach, with fine sand and crystal clear, warm and calm sea water. 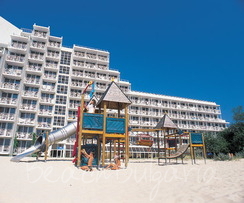 The tourist season in Albena resort lasts from May until October, when the use of the sea is guaranteed. The average annual temperature is around +12°C. In summer the air temperature here is over 25°C and often reaches 29-32°C. The sea water temperature in June, July, August and September is 22-25°C. In the 3rd week of May the temperature of the sea water reaches 20°C, whereas at the end of October it drops down to 15-16°C. 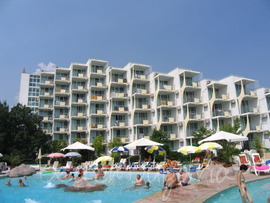 The mineral water in Albena resoer has the temperature of 30°C. It features slightly mineralization and it is hydro carbonated. The water contains calcium, magnesium, sulphurous oxide compounds: 2.2 mg/ I, free hydrogen sulphide with pH 7.39, discharge of 2580I/ min. The curative mud features mineralization 65.8 g/kg, magnesium - 3.6 g/kg, sodium - 18.0 g/ kg, calcium - 1.1 g/kg. The water contains hydrogen sulphide - 0.6 g/kg, biologically active substances, trace elements - copper, iodine, strontium, manganese, molybdenum. 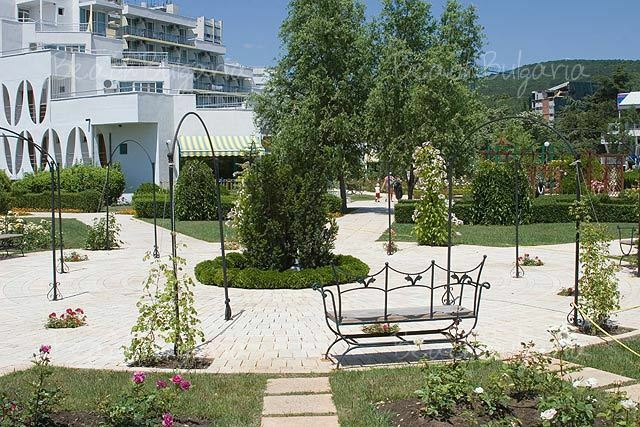 The hotels of Albena are situated in a park zone, either right on the beach or on the nearby hills, featuring panoramic sea views. There are approximately 43 hotels, 5 holiday villages and 1 campsite. 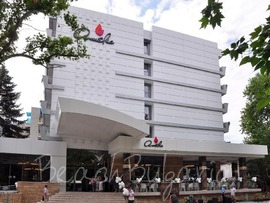 Albena offers many restaurants, cafes, taverns, fast food, bars and clubs. Different types of cuisine is served - Bulgarian, Indian, Chinese, Italian, etc. At the disposal of holidaymakers are swimming pools, water skiing, jets, bowling alley, boat-driving banana and such sports as water skiing, underwater fishing, yachting, para-sailing, surfing, tennis, horseback riding, diving school, mini golf, beach volleyball, hang-gliding, aerobics. For children are provided: an amusement park, water carting, fun fair, mini- trains, kids' discos, inflatable trampoline. 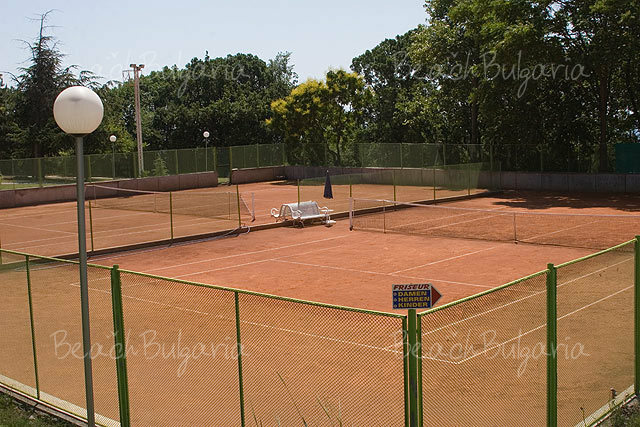 The Bus station is situated at 10 minutes walking distance from the center of Albena. 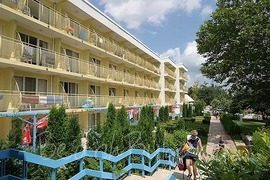 Albena is connected by bus transport with such resorts as Balchik, Golden Sands, Dobrich, etc. Albena offers the so called "Little Train" that is a wonderful way to get around the area. The train goes through Albena resort in 2 different routes. 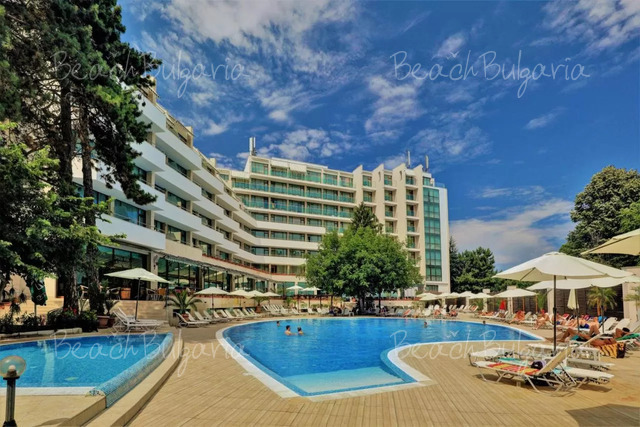 Albena is the best Black sea resort. It is green, quiet with fabulous sands and hotels. It is a pleasure to be there. The best hotel there is Flamingo. This is a salute to their host Hans Jürgen Becker makes the moment you leave.Please pass this message on Lieber Jürgen viele Grüsse aus dem Viertelchen in der Jungstrasse.Hugo und Biene. felicitari!!! m.am simntit nemaipomenit,demult nu am mai avut un concediu atat de linistit.mancarea.. personalul au fost super.. il recomand cu incredere mai ales familiilor cu copii,pentru piscina ,animatori numai cuvinte de lauda,si timpul ne.a fost favorabil,pe mine ma cucerit...inca odata felicitari..BULGARIA! MY wife and I stayed at Hotel Magnolia for 3 days. The staff at reseption were very helpfull. The only fault we found was the foodd was cold when we managed to get a table to eat. Beyond that the hotel was quite good . the fee bus service was very good. We enjoyed our stay there on the most part. It was our first time abroad. I would say to people that albina is a nice place to vist. We had a hot water problem first thing in the mornings. The rooms were super small & outdated. All 7 of us got sick with a stomach virus. The stuff told us that it has been like this the whole summer. 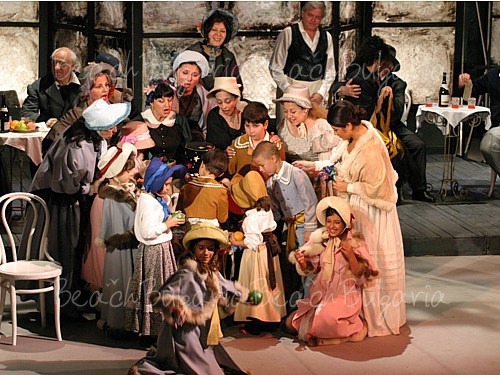 Many of the guests and staff were getting sick. The parking was a HUGE problem. Opposite the hotel there is a reservation with a small river that stank real badly. I wouldn't recommend this hotel to anybody. 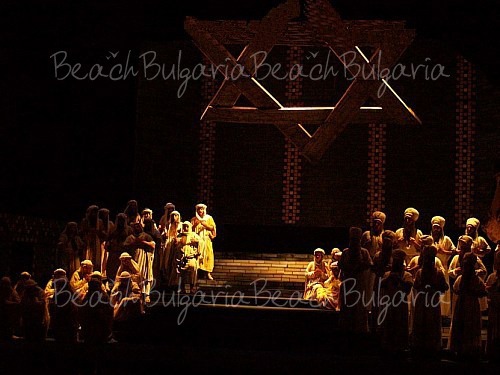 Please, post a comment on Albena. 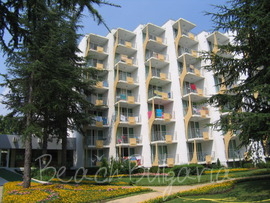 BeachBulgaria.com presents a variety of hotels and apartment complexes in Albena resort in Bulgaria. Available for booking on-line are Albena of various standards and prices. Just browse below and find the one that best fits your criteria! Book ispecial vacation packagein Albena and create memories that will last a lifetime. 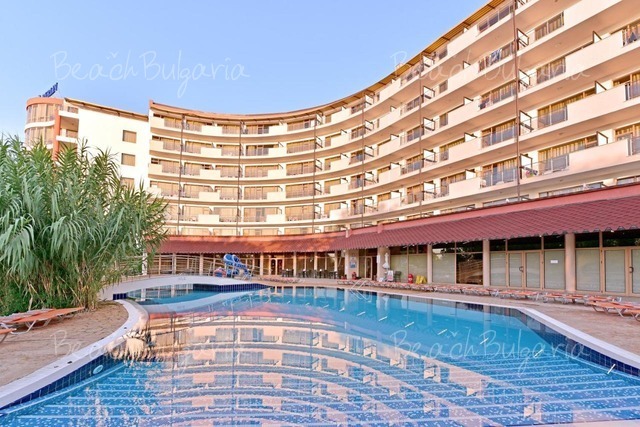 Golden sand beaches and pristine coastlines await you in Bulgaria. Treat yourself to a top vacation with our special package offers for a summer holiday. Select one of the diverse vacation packages fulfilling all of your vacation dreams.